This past June, families across the nation participated in The Great American Backyard Campout, part of the special event series from National Wildlife Federation’s Be Out There movement. This event encouraged families to get outside and spend an evening sleeping under the stars. If you missed this event, fortunately, you don't have to wait until next June to experience fun in your own backyard. Whether you're looking to test the waters for a "real" camping trip or are in need of a recipe for inexpensive family fun, backyard camping certainly fits the bill. And the neat thing about backyard camping is that you can make it as simple or as elaborate as you wish. You can invite extended family or friends to participate in your adventure or you can go at it alone. You can prepare your food in advance or you can cook it "on site". With backyard camping, you can really rough as much or as little as you feel comfortable with. For a basic backyard campout, you'll need a tent, sleeping bag, bug spray, flashlight for each camper and a lantern. If you plan to cook, you'll need a grill or open fire (portable fire pits can be a nice alternative to open ones) and cooking utensils. Camping chairs and a card table can added to make the experience feel more authentic and like you're truly away from home. To minimize the number of times you go in the house, be sure to stock a cooler with food and drinks and pack graham crackers, marshmallows and Hershey bars so you can make your own S'mores. You'll also want to bring along paper products and plastic utensils, as well as set up a secure trash bin to keep your camp site clean. During your campout, encourage everyone to go tech free and spend your time together star gazing, telling stores and singing campfire songs. You can even collect rocks, look for bugs or go on a scavenger hunt, all while a few feet from your back door. When it gets dark, play a game of flashlight tag before heading to bed and calling for lights outs. 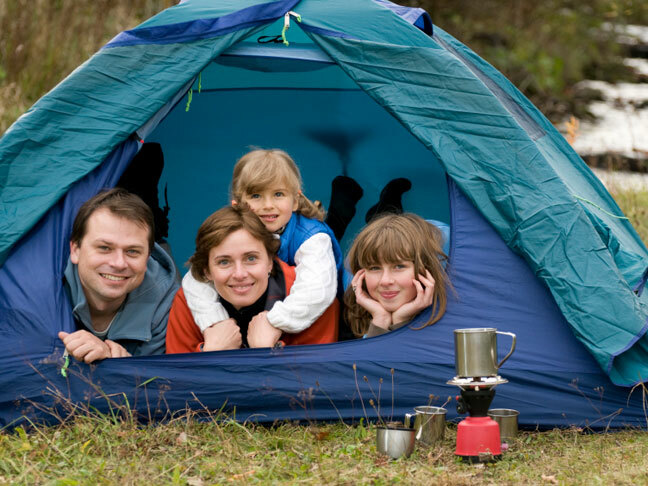 In addition to giving everyone a break from their laptops, iPads and more, camping can really be a wonderful family bonding experience. Whatever you do during your backyard camp out, the point is you are doing it together. Did you participate in the Great American Backyard Campout? Have you camped outback with your kids? Share your experiences below! We'd love to hear them.